Monet, as everyone knows, was primarily a landscape painter. But early in his career, Monet painted portraits, still lifes and interiors which showed amazing ability in these types of images, also. He simply preferred the landscape, and water in particular, first the seacoast, then the Seine River, and finally the pond in his garden at Giverny. Monet, Renoir, and by this time Pissarro, Morisot, Sisley, Bazille, and at this point Cezanne, and others were now joining together in their new vision of painting. Monet's first landscapes, although freshly and boldly painted, had not been so very far from the officially accepted rules of painting. SPECIAL NOTE : The painter will make the reproduction as close to the original oil painting as possible. 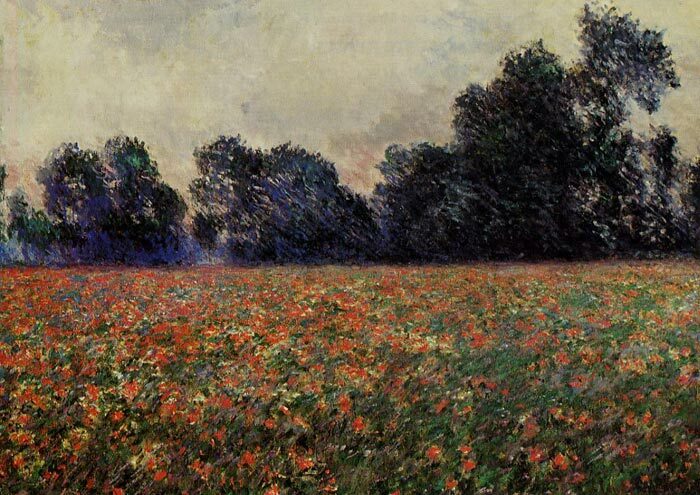 If you want your painting to alter from this likeness, please email us and " Poppies at Giverny, 1887	" will be reproduced according to your special requirements.